This article is about the band. For other uses, see Belle and Sebastian (disambiguation). Belle and Sebastian are a Scottish band formed in Glasgow in January 1996. Led by Stuart Murdoch, the band has released nine albums. Much of their work had been released on Jeepster Records, but they are now signed to Rough Trade Records in the United Kingdom and Matador Records in the United States. Belle and Sebastian were formed in Glasgow, Scotland in 1994 by Stuart Murdoch and Stuart David, both of whom had enrolled at Stow College's Beatbox program for unemployed musicians. Together, with music professor Alan Rankine (formerly of The Associates), they recorded some demos, which were picked up by the college's Music Business course that produces and releases one single each year on the college's label, Electric Honey. 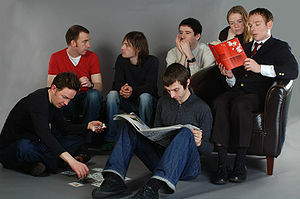 As the band had a number of songs already and the label was extremely impressed with the demos, Belle and Sebastian were allowed to record a full-length album, which was recorded mostly live over three days, entitled Tigermilk. Murdoch once described the band as a "product of botched capitalism". The band took their name from the television adaptation of the French novel Belle et Sébastien about a six-year-old boy and his dog. Tigermilk was recorded in three days and originally only one thousand copies were pressed in vinyl. These original copies now sell for up to £400. The warm reception the album received inspired Murdoch and David to turn the band into a full-time project, recruiting Stevie Jackson (guitar and vocals), Isobel Campbell (cello/vocals), Chris Geddes (keys) and Richard Colburn (drums) to fill out the group. After the success of the debut album, Belle and Sebastian were signed to Jeepster Records in August 1996 and If You're Feeling Sinister, their second album, was released on 18 November. The album was named by Spin as one of the 100 greatest albums between 1985 and 2005, and is widely considered the band's masterpiece. Just before the recording of Sinister, Sarah Martin (violin/vocals) joined the band. Following this a series of EPs were released in 1997. The first of these was Dog on Wheels, which contained four demo tracks recorded before the real formation of the band. In fact, the only long-term band members to play on the songs were Murdoch, David, and Mick Cooke, who played trumpet on the EP but would not officially join the band until a few years later. It charted at No. 59 in the UK singles chart. The Lazy Line Painter Jane EP followed in July. The track was recorded in the church where Murdoch lived and features vocals from Monica Queen. The EP narrowly missed out on the UK top 40, peaking at No. 41. The last of the 1997 EPs was October's 3.. 6.. 9 Seconds of Light. The EP was made Single of the Week in both the NME and Melody Maker and reached No. 32 in the charts, thus becoming the band's first top 40 single. The title of the album, The Boy with the Arab Strap caused some tension between Belle and Sebastian and fellow Scots band Arab Strap. The band released their third LP, The Boy with the Arab Strap in 1998, and it reached No. 12 in the UK charts. Arab Strap garnered an NPR interview  and positive reviews from Rolling Stone and the Village Voice, among others; however, the album has its detractors, including Pitchfork, who gave the album a particularly poor review, calling it a "parody" of their earlier work (Pitchfork has since removed the review from their website, but re-reviewed the album positively in 2018). During the recording of the album, long-time studio trumpet-player Mick Cooke was asked to join the band as a full member. The This Is Just a Modern Rock Song EP followed later that year. In 1999 the band was awarded with Best Newcomer (for their third album) at the BRIT Awards, upsetting better-known acts such as Steps and 5ive. That same year, the band hosted their own festival, the Bowlie Weekender. Tigermilk was also given a full release by Jeepster before the band started work on their next LP. The result was Fold Your Hands Child, You Walk Like a Peasant, which became the band's first top 10 album in the UK. A stand-alone single, "Legal Man", reached No. 15 and gave them their first appearance on Top of the Pops. Belle and Sebastian performing at the 9:30 Club in Washington, D.C.
As the band's popularity and recognition was growing worldwide, their music began appearing in films and on television. The 2000 film High Fidelity mentions the band and features a clip from the song "Seymour Stein" from The Boy with the Arab Strap. Also, the title track from Arab Strap was played over the end credits of the UK television series Teachers, and the lyric "Colour my life with the chaos of trouble" from the song was quoted by one of the characters in the 2009 film (500) Days of Summer. Stuart David soon left the band to concentrate on his side project, Looper, and his book writing, which included his The Idle Thoughts of a Daydreamer. He was replaced by Bobby Kildea of V-Twin. The "Jonathan David" single, sung by Stevie Jackson, was released in June 2001 and was followed by "I'm Waking Up to Us" in November. "I'm Waking Up to Us" saw the band use an outside producer (Mike Hurst) for the first time. Most of 2002 was spent touring and recording a soundtrack album, Storytelling (for Storytelling by Todd Solondz). Campbell left the band in the spring of 2002, in the middle of the band's North American tour to pursue a solo career, first as The Gentle Waves, and later under her own name. She later collaborated with singer Mark Lanegan on three albums. The band left Jeepster in 2002, signing a four-album deal with Rough Trade Records. Their first album for Rough Trade, Dear Catastrophe Waitress, was released in 2003, and was produced by Trevor Horn. The album showed a markedly more "produced" sound compared to their first four LPs, as the band was making a concerted effort to produce more "radio-friendly" music. The album was warmly received and is credited with restoring the band's "indie cred". The album also marked the return of Murdoch as the group's primary songwriter, following the poorly received Fold Your Hands Child, You Walk Like a Peasant and Storytelling, both of which were more collaborative than the band's early work. A documentary DVD, Fans Only, was released by Jeepster in October 2003, featuring promotional videos, live clips and unreleased footage. A single from the album, "Step into My Office, Baby" followed in November 2003; it would be their first single to be taken from an album, and included a track recorded with Divine Comedy producer Darren Allison entitled Love On The March. The Thin Lizzy-inspired "I'm a Cuckoo" was the second single from the album. It achieved their highest chart position yet, reaching No. 14 in the UK. The Books EP followed, a double A-side single led by "Wrapped Up in Books" from Dear Catastrophe Waitress and the new "Your Cover's Blown". This EP became the band's third top 20 UK release, and the band was nominated for both the Mercury Music Prize and an Ivor Novello Award. In January 2005, B&S was voted Scotland's greatest band in a poll by The List, beating Simple Minds, Idlewild, Travis, Franz Ferdinand, and The Proclaimers, among others. In April 2005, members of the band visited Israel and the Palestinian territories with the UK charity War on Want; the group subsequently recorded a song inspired by the trip titled "The Eighth Station of the Cross Kebab House", which would first appear on the digital-download version of the charity album Help! : A Day in the Life and would later have a physical release as a B-side on 2006's "Funny Little Frog" single. Push Barman to Open Old Wounds, a compilation of the Jeepster singles and EPs, was released in May 2005 while the band were recording their seventh album in California. The result of the sessions was The Life Pursuit, produced by Tony Hoffer. The album, originally intended to be a double album, became the band's highest-charting album upon its release in February 2006, peaking at No. 8 in the UK and No. 65 on the US Billboard 200. "Funny Little Frog", which preceded it, also proved to be their highest-charting single, debuting at No. 13. On 6 July 2006, the band played a historic show with the Los Angeles Philharmonic at the Hollywood Bowl. The opening act at the 18,000 seat sell-out concert was The Shins. The members of the band see this as a landmark event, with Stevie Jackson saying, "This is the biggest thrill of my entire life". In October 2006, members of the band helped put together a CD collection of new songs for children titled Colours Are Brighter, with the involvement of major bands such as Franz Ferdinand and The Flaming Lips. On 18 November 2008 the band released The BBC Sessions, which features songs from the period of 1996–2001 (including the last recordings featuring Isobel Campbell before she left the band), along with a second disc featuring a recording of a live performance in Belfast from Christmas 2001. On 17 July 2010, the band performed their first UK gig in almost four years to a crowd of around 30,000 at Latitude Festival in Henham Park, Southwold. They performed two new songs, "I Didn't See It Coming" and "I'm Not Living in the Real World". Their eighth studio album, released in the UK and internationally on 25 September 2010, was titled Belle and Sebastian Write About Love. The first single from the album, as well as the record's title track "Write About Love", was released in the US on 7 September 2010. Write About Love entered the UK albums chart in its first week of release, peaking at No. 8 as of 19 October 2010. Norah Jones is featured on the track "Little Lou, Ugly Jack, Prophet John". In December 2010 Belle and Sebastian curated the sequel to the Bowlie Weekender in the form of Bowlie 2 presented by All Tomorrow's Parties. In 2013, Pitchfork TV released an hour-long documentary in February, directed by RJ Bentler which focused on the band's 1996 album If You're Feeling Sinister, as well as the formation and early releases of the band. The documentary featured interviews with every member that was present on the album, as well as several archival photos and videos from the band's early days. The band compiled a second compilation album The Third Eye Centre which included the b-sides and rarities released after Push Barman to Open Old Wounds, from the albums Dear Catastrophe Waitress, The Life Pursuit, and Write About Love. In an interview at the end of 2013, Mick Cooke confirmed he had left the band on good terms. The band received an 'Outstanding Contribution To Music Award' at the NME Awards 2014. In 2014, the band returned to the studio, recording in Atlanta, Georgia for their ninth studio album, along with announcing tour dates for various festivals and concerts across the world during 2014. Their ninth album Girls in Peacetime Want to Dance was released on 19 January 2015. It was their first album with Dave McGowan, who had been their touring bassist since 2011. The Belle and Sebastian song "There's Too Much Love" forms much of the soundtrack for the Brazilian film The Way He Looks, about a blind, gay teenage boy and his friends, released in 2014. Belle and Sebastian performed at the world-famous Glastonbury Festival on Sunday 28 June 2015, on 'The Other Stage' and at O2 Academy, Glasgow in March 2017 which was televised in the U.K. as part of the 'BBC 6 MUSIC Presents Festival'. In mid-2017, the band put out a new single, "We Were Beautiful". In December 2017 and January and February 2018, the band released a trio of EPs under the name How to Solve Our Human Problems. On 3 November 2018, the band announced that Dave McGowan had officially become a member. The Reindeer Section were a Scottish indie rock supergroup formed in 2001 by Gary Lightbody of Snow Patrol, which released albums and gigged in 2001 and 2002. It featured Richard Colburn, Mick Cooke and Bobby Kildea from Belle and Sebastian. The Vaselines are an alternative rock band from Glasgow formed in Glasgow in 1986. Between 2008 and 2014 their lineup featured Stevie Jackson and Bobby Kildea from Belle and Sebastian and they performed at Bowlie Weekender 2 curated by Belle and Sebastian in December 2010. Tired Pony is a country / Americana supergroup formed by Gary Lightbody of Snow Patrol in 2010. It features Richard Colburn from Belle and Sebastian. God Help the Girl is a musical project by Stuart Murdoch, featuring a group of female vocalists, including Catherine Ireton, with Belle and Sebastian as the accompanying band. ^ a b Erlewine, Stephen Thomas. "Belle and Sebastian – Biography". AllMusic. Retrieved February 5, 2017. ^ Klett, Steven (21 January 2015). "Rock Review Roundup: Sleater Kinney, the Decemberists, Belle and Sebastian". News Cult. Retrieved 5 February 2017. ^ "Belle and Sebastian, The New Pornographers In Concert". NPR. Retrieved 19 August 2016. ^ "Belle and Sebastian: Girls in Peacetime Want to Dance". PopMatters. Retrieved 19 August 2016. ^ Gallo, Phil (2006-07-09). "Belle & Sebastian / L.A. Philharmonic; the Shins". Variety. Retrieved 2018-02-01. ^ "Line-up – Latitude Festival 2011". Latitudefestival.co.uk. Archived from the original on 28 September 2011. Retrieved 7 April 2011. ^ "Belle and Sebastian Concert Setlist at Latitude Festival, Southwold on July 17, 2010". setlist.fm. Retrieved 7 April 2011. ^ "News". Belle and Sebastian. Archived from the original on 24 November 2010. Retrieved 7 April 2011. ^ "Archive Chart". Theofficialcharts.com. 23 October 2010. Archived from the original on 15 June 2011. Retrieved 24 November 2010. ^ Pitchfork (2013-02-18). "Pitchfork.tv Presents a Documentary Film on Belle and Sebastian's If You're Feeling Sinister". Pitchfork. Retrieved 2013-02-19. ^ "Interview: Mick Cooke (formerly) of Belle & Sebastian". The Current. Retrieved 4 June 2014. ^ "Belle & Sebastian win Outstanding Contribution To Music Award at NME Awards 2014 with Austin, Texas". NME.com. Retrieved 4 June 2014. ^ "Belle And Sebastian confirm new album recording sessions". NME.com. Retrieved 4 June 2014. ^ "Live Dates". Belle and Sebastian official website. Retrieved 4 June 2014. ^ Ham, Robert (31 March 2015). "Belle & Sebastian find ways to keep their music fresh after 20 years". The Oregonian. Retrieved 18 January 2019. ^ Eddie Fu (2017-07-28). "Belle and Sebastian share new track "We Were Beautiful": Stream". Consequence of Sound. Retrieved 2017-09-28. ^ "Belle & Sebastian announce three new EPs: 'People need an escape from the dystopia'". NME.com. Retrieved 10 October 2014. ^ Belle and Sebastian (3 November 2018). "...and then there were 7! Dave just made it official and joined the band". Facebook. Retrieved 18 January 2019. Wikimedia Commons has media related to Belle & Sebastian.